The MB Series filters go beyond the simple taste improvement by also removing dissolved inorganics such as fluoride, iron, lead, etc (which happen to make up about 95% of all contaminants). 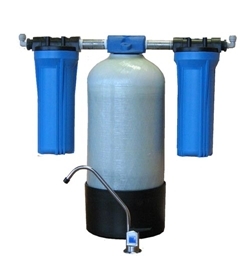 This filter is a combination of deionization resin and activated carbon. The water from the MB Series filter is comparable in purity to water produced from reverse osmosis (R/O) or steam distillation. But its advantage over these two other high purity methods is that it produces filtered water quickly (1 gallon per minute) and does not waste any water. This is a critical consideration for large offices – you will never run out of water with an MB Series system. Whereas, reverse osmosis produces water a drop at a time, requiring a storage reservoir that can run dry. Are you ready for quality drinking water but without the bottles? 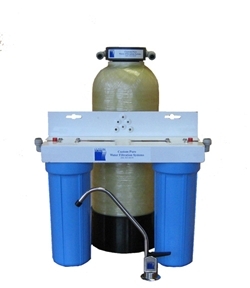 Just request a Work Place Water Consultation and we will recommend equipment specific to your needs.